What’s happening with ManzilBooks? For those joining in now, here’s my plea to the community asking to donate books, and here’s the first #manzilbooks event we held at Wild Peeta. Initially, the school wanted to hold their booksale in June, but haven’t hit the required 10,000 books the people helping them organise the event have requested for the sale to be held in the first place. Where have they reached? With our donations and independent ones, they’ve passed 4,000. For this reason, they’ve decided to extend the duration of collection over the summer, and hopefully hit the target and carry out the event after the summer, and after Eid. I’m the contact person for pick-up points near Dubai Media City, Dubai Internet City, Emirates Hills, Greens, Meadows, Springs, Lakes, JLT, JBR, the Marina. Anastasia (@TDAllonsy) will be looking after Dubai Silcon Oasis, Dubai International Academic City (DIAC) and the surrounding areas. 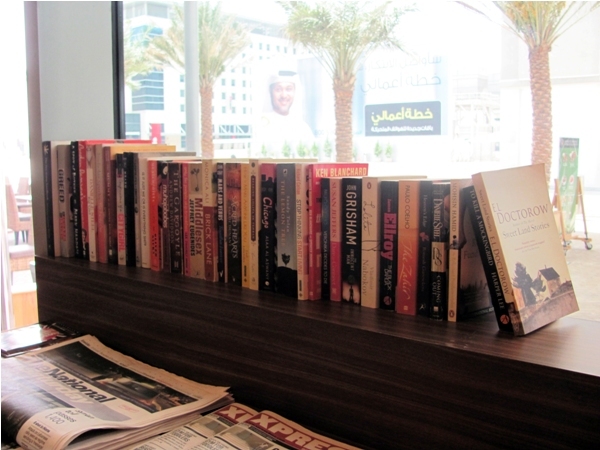 Alternatively, Wild Peeta has generously donated its Dubai World Trade Centre outlet as a drop-off point. If dropping the books off there is more convenient, then please do so. Do drop me an email (autism [at] devinadivecha [dot] com) to let me know you’ve done so. There’s a collection of books people have dropped off along with these lovely bookmarks for people to have a sit-down and read while they eat (make sure you don’t drop any food or drink on the books!). We hope you’ll spread the word…if anyone is thinking of getting rid of their books, please point them our way!